Economic conditions in Portugal have improved. The health of public finances and the financial system are still key challenges. Future prosperity will depend on the utilisation of labour and productivity growth. The economy can still be more outward oriented. The efficiency of the judicial system can be further improved. Key recommendations Improving fiscal sustainability and financial stability •	Continue gradual fiscal consolidation to ensure the decline of public debt. •	S implify the tax system by reducing the use of special provisions (e.g. tax exemptions, special rates) and ambiguity in the tax language. •	C  ompetent authorities should continue to monitor NPL reduction plans, translating performance in achieving targets into capital requirements. •	M  ake bankruptcy a viable solution for heavily indebted individuals, reducing the time to discharge and exempting more of the debtor’s assets from bankruptcy proceedings. •	Introduce an out-of-court mechanism to facilitate the liquidation of non-viable firms. Further promoting export performance •	T arget lifelong learning opportunities to the low-skilled, including by collecting information on the private returns to skills and making it publicly available. •	In awarding port concessions, take into account the price that bidders will charge port users in addition to other criteria. •	E nsure that port concession contracts specify a minimum level of investment by the operator and do not renew concessions without opening a new public tender. Enhancing the judiciary to foster economic activity •	Increase the managerial autonomy of the courts so that they can effectively allocate resources such as judges, other judiciary staff and budgets. •	F ully analyse the data collected from the information system on court proceedings (CITIUS) so that it allows the courts to identify problematic cases and those that should be prioritised. •	Set up an independent supervisory body to ensure that regulations in the legal profession are in the public interest. •	C  ontinue to enhance the capacity of the Public Prosecution Office to address economic and financial crime, including corruption. Public prosecutors should continue to undertake specialised training in this area. •	Establish an electronic registry of interests for all government members and senior civil servants that is regularly updated. Improving labour utilisation and reducing poverty •	A  void across-the-board rises in hiring subsides, limiting them to those at high risk of long-term unemployment and those at risk of poverty. •	E xpand well-designed vocational training programmes (i.e. “Aprendizagem” and “Cursos de Educação e Formação de Adultos”), so that they reach more of the low-skilled population. •	C  onsolidate the two vocational education systems into a single dual VET system with strong workplace training and perform a thorough evaluation of all vocational training programmes. Recalibrating the economy for greener growth •	E ncourage public transport use and the development of new shared transport solutions, accompanied by appropriate supervision and regulation. •	Raise taxes on diesel fuel, and increase energy taxes on coal and natural gas. 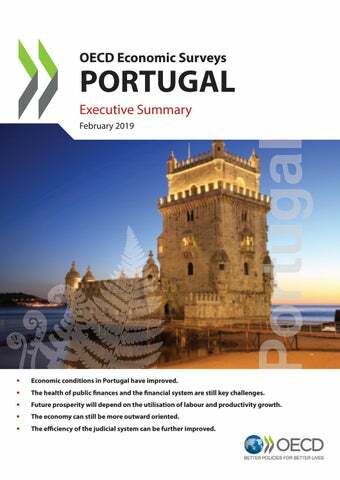 The economy has recovered Economic conditions in Portugal have improved markedly over the past few years. GDP is now back to its pre-crisis level and the unemployment rate has declined 10 percentage points since 2013 to below 7%, one of the largest reductions in any OECD country over the past decade. Nevertheless, legacies of the crisis remain, with the poverty rate of the working age population still elevated and perceptions Figure A. The recovery is well entrenched of subjective wellbeing below pre-crisis levels. The recovery has now broadened to domestic demand. Strong exports sustained economic activity in the years immediately following the crisis. This was underpinned by rapid growth in the tourism sector, as well as exports across a variety of manufacturing sectors that reflected improvements in product quality and a decline in relative export prices. Machinery and equipment investment is now rising strongly again and housing investment is being stoked by rising dwelling prices. Consumption has also made a solid contribution to GDP growth over the past few years, buoyed by rising private earnings. The economy is projected to continue expanding at a stable pace. GDP is projected to rise by around 2% a year between 2018 and 2020 (Table A). Further employment gains and rising real wages will underpin consumption growth and inflation will rise slightly. An anticipated slowdown in the pace of activity in Portugal’s major trading partners will provide a headwind to further export growth. Risks to the outlook exist. These include an increase in interest rates, potentially stemming from the normalisation of monetary policy by the European Central Bank, which could negatively impact business and household spending. Source: OECD Economic Outlook: Statistics and Projections (database), November. Source: OECD Economic Outlook: Statistics and Projections (database). There is also scope to buttress public finances through broadening the tax base. The use of consumption tax exemptions and reduced rates narrows the tax base and should be minimised. Furthermore, there is scope to raise environmental taxation, given that the domestic pricing of some fuel sources do not reflect the environmental costs of their use. Future prosperity will depend on the utilisation of labour and productivity growth Subjective wellbeing is low, reflecting modest living standards compared with other OECD countries and little convergence over the past few decades. To narrow wellbeing gaps, there should be a continued focus on getting unemployed or marginalised workers back into jobs. Despite recent progress, the long-term unemployment rate remains comparatively high, especially among the low-skilled. The government has been encouraging the employment of such workers through the provision of hiring subsidies, up-skilling and re-skilling programmes. Nevertheless, vocational training programmes that have been found to have a positive impact on the employment prospects of participants should be expanded to reach more of the low-skilled population. Source: OECD (2018), Trade in goods and services (indicator); OECD (2018), FDI stocks (indicator). Convergence in living standards can also be promoted through reawakening productivity growth, which has slowed over the past two decades. One of the benefits of higher productivity will be to boost the external competitiveness of the economy (see Chapter 1). Exports as a share of GDP and the stock of foreign direct investment still remain below that of other comparable small European economies (Figure D), although higher than the euro area average. Competition-enhancing reforms to regulatory settings would raise efficiency. Strict regulations in some services sectors including professional services and transport are particularly harmful for productivity. For example, various professional services are both strictly regulated and represented by the same professional association. These include lawyers, where the Bar Association is responsible for formulating restrictions on entry, lawyersâ&#x20AC;&#x2122; fees and the form of business. To ensure that regulations in these industries are in the public interest, independent supervisory bodies should be established that approve any new regulatory arrangements and promote competition within the profession. contract enforcement in a timely manner and reduce the cost of making transactions in the market, thereby promoting competition. It is particularly important for financial transactions to ensure collateral enforcement and therefore creditorsâ&#x20AC;&#x2122; rights. Long and complex court proceedings are reflected in a very low collateral recovery rate, which can negatively affect bank lending conditions. At present, inefficiencies in the court system result from difficulties in effectively managing the case workload. The information system that registers court proceedings can be more fully utilised for the purpose of workload assessment, to prioritise cases and inform resource allocation across the judiciary. There is also scope to strengthen the autonomy of courts, which have been given greater accountability without increased capacity to manage resources. Greenhouse gas emissions per unit of GDP are below the OECD average. Nevertheless, progress in decoupling emissions from GDP has stalled in recent years. Transport accounts for a large share of pollution and emissions and has been reducing its environmental impact at a slower pace than other sectors in the economy. This partly reflects the very high share of passenger cars that are used relative to public transport. As well as raising tax on some forms of energy, such as coal and natural gas, new shared transport solutions should be encouraged, accompanied by appropriate supervision and regulation. Consult this publication on line at https://doi.org/10.1787/eco_surveys-prt-2019-en. 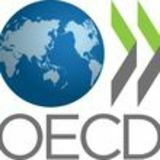 This work is published on the OECD iLibrary, which gathers all OECD books, periodicals and statistical databases. Visit www.oecd-ilibrary.org for more information.